Breakfast parfaits is such a nice name for a dessert. The funny thing is that the word “Parfait” is basically French, but can’t be used to refer that kind of recipe, for instance. In France, a Parfait is actually a dessert made with heavy cream & egg yolks. Quite far from this recipe, right? But like I was writing in the French version of this recipe, “Parfait” makes it definitely more handy for a recipe title. – OOOOR as you probably don’t spend your life eating just raclette – that’s one of my secret dreams though – or chocolate, you want to highlight the fact that your recipe is super healthy, sugar-free, gluten-free, or will make you poop glitters. Oh no wait, the title is already too long. If it would only rely on me, I would probably call this recipe “Chia seeds & blueberries & chocolatey granola sugar-free parfaits”. But no. To be honest, the dilemma is pretty okay in english, the task is always getting harder when it comes for me to “think my recipes in French”. 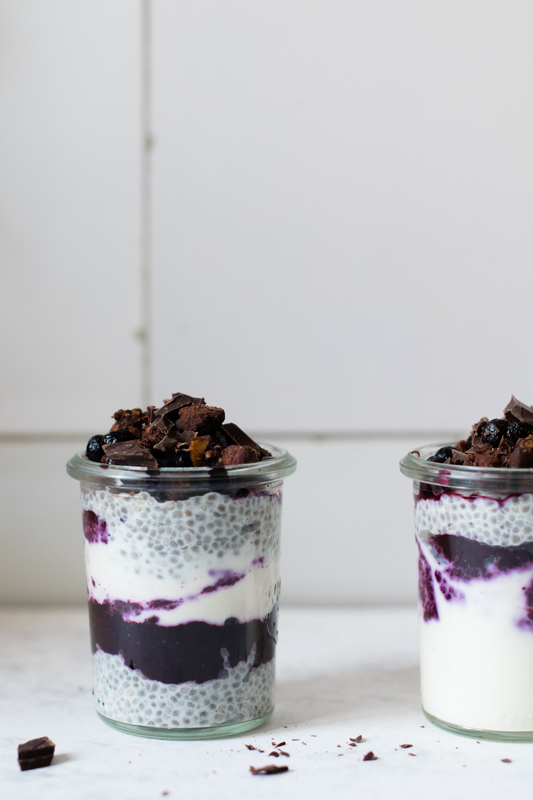 Anyway, those breakfast parfaits are made with chia seeds & blueberry chia jam. 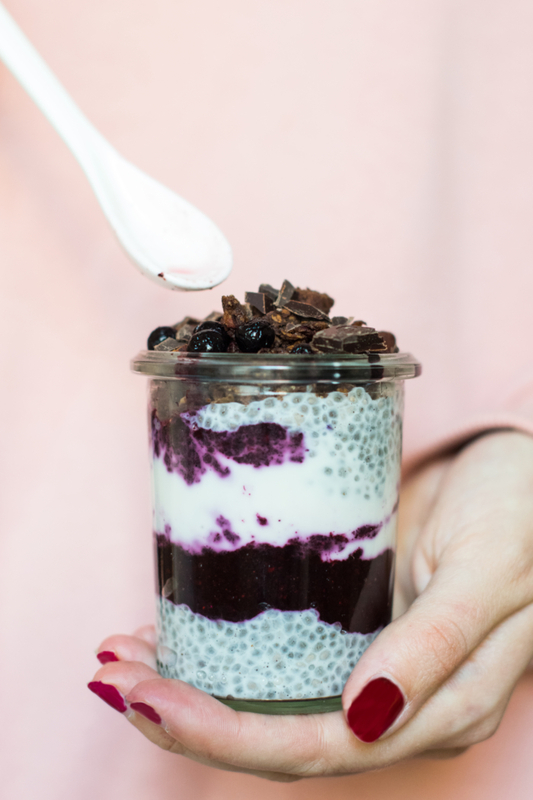 In case if it’s too much chia for your delicate tastebuds, you can still replace a part of chia pudding by some creamy Greek yogurt. Or some coconut yogurt. Or some soy yogurt also. I would be a liar if I say that the mix of chia pudding, chia jam & yogurt is interesting, texture speaking. 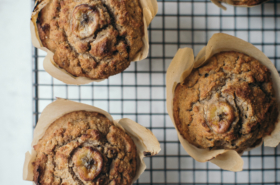 But the interest of this recipe is nutritional above all, as those breakfast parfaits are also protein packed and perfect for a post-workout or post-running sweet treat. 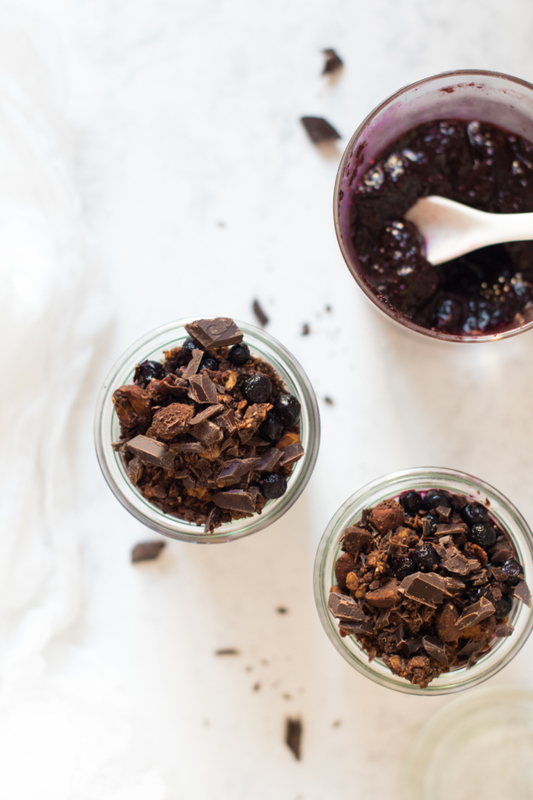 Chocolate granola brings an extra touch for the sweet tooth, as well as a nice crunchy texture. 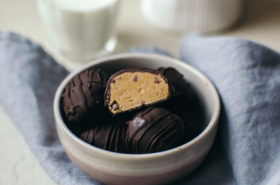 And as chocolate is your everything – after Raclette, indeed -, a few dark chocolate chunks (>85% to keep a low sugar rate) on the top will perfect this healthy snack. 1. Prepare the blueberry chia jam: pour all ingredients in a blender bowl - after you let unfreeze blueberries, if they weren't fresh -. Blend the whole until homogeneous consistency. 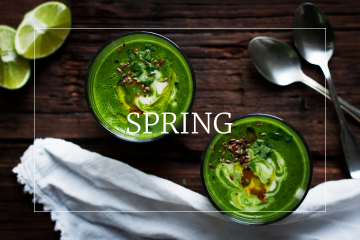 Pour in a bowl and let rest in fridge for about 2-3h minimum. 2. 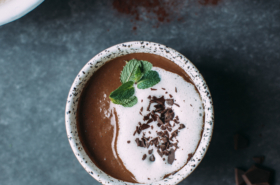 Prepare the chia pudding: pour chia seeds & vanille beans in a bowl. Add milk and stir well. Put in fridge and let rest at least 3h. You can stir it a few times. 3. 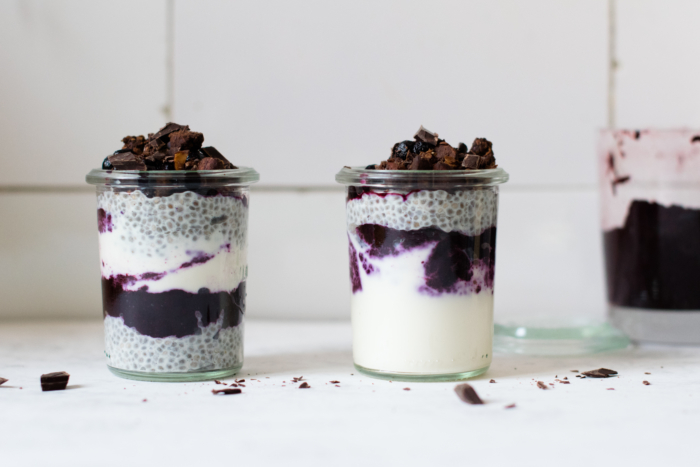 Set the breakfast parfaits: pour a first layer of chia pudding, then some blueberry chia jam. 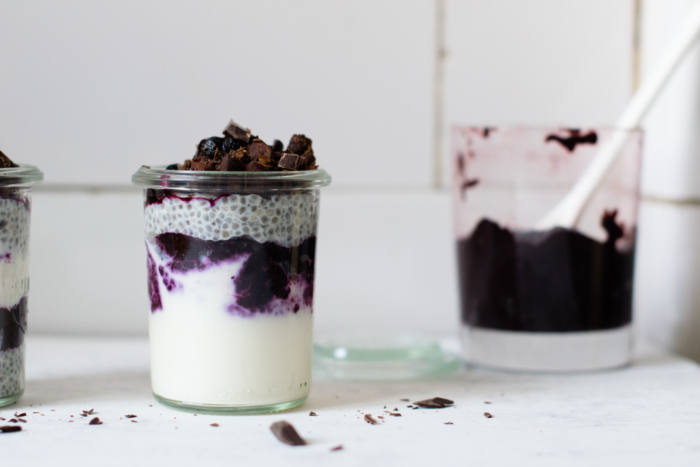 Add a layer of yogurt, then a layer of chia again: either blueberry chia jam or chia pudding, as you want. Top with chocolate & amaranth granola. Shred one square of chocolate & sprinkle on the top. Repeat for each breakfast pudding.